The name probably survives from the 'broad estate' of the Saxons, which has remained as an open green. 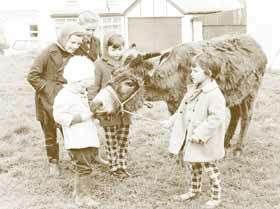 In the early 1960�s Ray Ham's donkey, Arabella, roamed the Broad Hill. Here with J. Burrow, G. Burrow, A. Elliot, S. Jennings and L. Elliot. The Broad Hill was formerly used by the cottagers for stacking their wood faggots and for their clothes lines. The copper beech tree was planted to commemorate the coronation of King George VI in 1937. 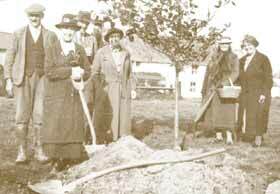 Planting a tree on the Broad Hill to celebrate the Coronation in 1937 of George VI. with A.G. Elliott, Mrs. R.L. Ashton, R.L. Ashton, Miss Grace Ashton, Miss Allen, Mrs. Alfred Slee. Two cherry trees were planted on the Broad Hill to commemorate the Coronation in 1953. It was cleaned up, levelled and re-seeded in 1966 to commemorate the death of Sir Winston Churchill.